I love Soap and Glory, I’ve said it many times and I will say it again. They just can’t do wrong in my books. Cosmetics, bath, body and skincare; They’ve got it all going on. 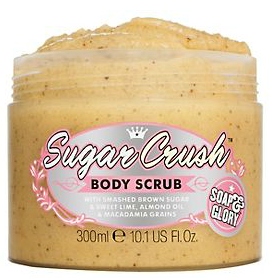 I am seriously lusting over this Sugar Crush scrub. I have smelt the Sugar Crush scent previously and oh my. Have mercy. It smells so good. I love a fresh, zesty scent and the lime in this bad boy is great! I have used Pulp Friction in the past and loved it and now this is on my radar I may have to take a sneeky trip down to Boots at some point. I need to have beautifully exfoliated skin for when I go on holiday soon don’t I? This is how I am going to justify this purchase. Come at me. Has anyone used this scrub? Would you recommend it? ← #59 My Make-up Storage!